This review is a bit different than the others. 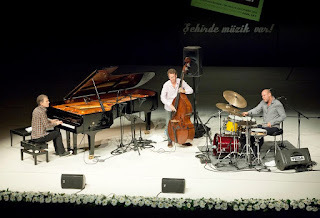 This is review of not only a wonderful performance but also a trip to Antalya just to experience Brad Mehldau Trio and a small interview with Brad Mehldau, that I set on missing the İstanbul concert, which was heard to be cancelled first then decided to be held in Bahçeşehir Cultural Center on December 1st. 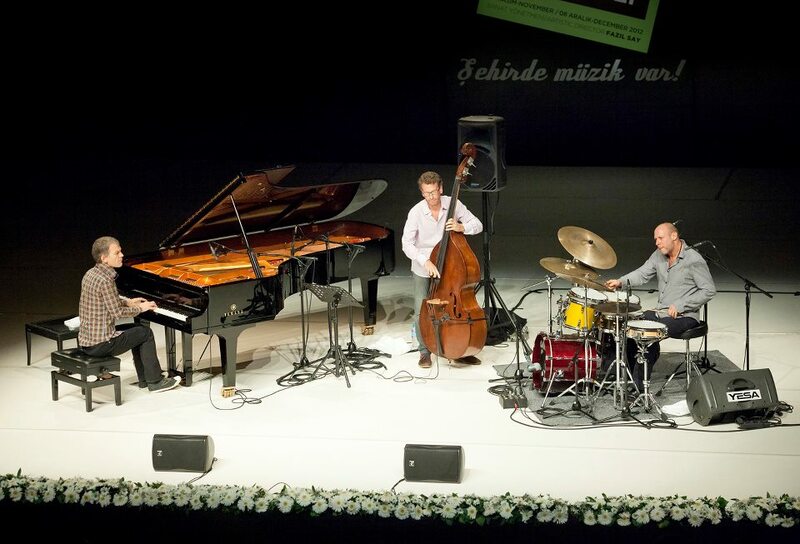 Antalya Piano Festival, which is mainly concentrated in classical music and good at this, has already caught my attention with its jazz events. At last, they strongly deserved to be visited by inviting two very important trios to the festival on their 13th years. It is evident that they take this festival serious considering performances of Chick Corea Trio with Christian McBride and Brian Blade on November 28th and Brad Mehldau Trio on December 2nd. I have to say that I am impressed by the organization, concert hall and the attention of the audience. It is certainly necessary to explain Brad Mehldau in detail however we need a dedicated review for him to achieve this. Thus, to summarize, the famous pianist has been performing since 1990 and made his best while he was in trio configuration. Although we see Jorge Rossy as the drummer of the trio until 2005, Jeff Ballard became a part of the trio later on. Larry Grenadier is with Brad Mehldau from the beginning with his double bass. The first trio recorded many great albums in series of Art of The Trio as well as live records. Among many albums recorded with the new trio, two albums Ode and Where Do You Start are the ones in which they are touching to the borders of trio jazz. Besides playing with his trio, Brad Mehldau played solo and took part in albums and live performances with famous musicians all over the world. The concerts in İstanbul and Antalya are held within their international tour after latest release Where Do You Start. Why did I say international? Because, I care about that such an important band can give two days to Turkey within their schedule. Surely, I wish Ankara could manage to overcome the recent recession and invite these musicians, who can hardly come from USA to Turkey from a long way and we can host them for three days. 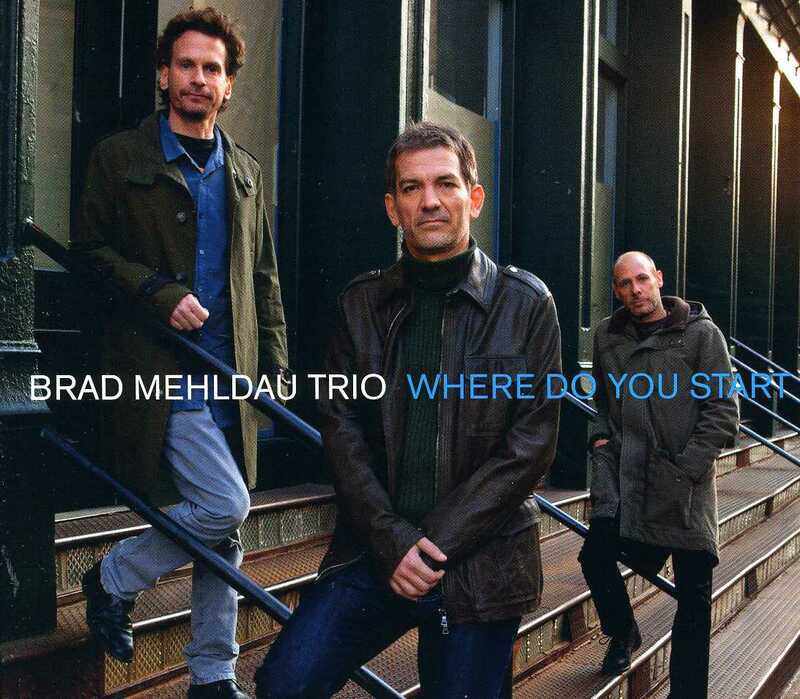 I have seen that almost all records of Brad Mehldau including even old ones were there at the concert hall’s waiting room with modest prices. I immediately filled the gaps in my archive. Antalya Cultural Center is a very suitable place for such performances in my opinion. The audience is relevant, however more than a jazz audience they were classical music listeners as far as I have seen. I can say that the performance started as pushing. First we have listened to a great arrangement of Jimi Hendrix’s Hey Joe (composed originally by Billy Robert), which is treated gently. 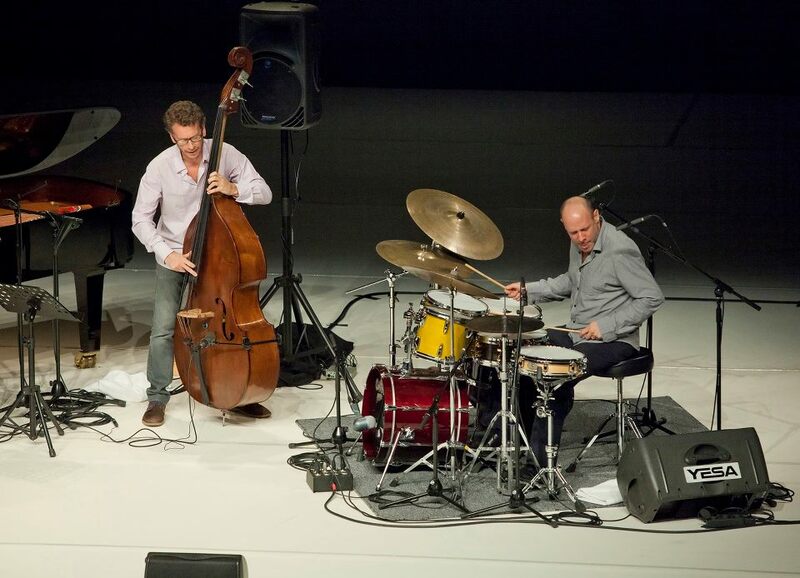 Brad Mehldau, Jeff Ballard and Larry Grenadier took part in the performance slowly and consecutively. Sanctus from Brad Mehldau and Friends from Brian Wilson of Beach Boys are played after the first piece with no word from the trio. After these three pieces, Brad Mehldau thanked us and introduced the pieces played so far and that will be played next. After that, To Hold On or To Let Go again from Brad Mehldau and Airegin from Sonny Rollins are performed. Following the last thank and introduction we experienced Since I Fell for You from Buddy Johnson. It is a real blues ballad with Brad Mehldau’s words. I think this is the most important performance of the concert. We held our breaths especially during the part that Brad Mehldau created a unique artistic piece by transfiguring the main theme while his trio members were silently watching him. I will never forget the long drum solo achieved by strong-soft touches and great stick control of Jeff Ballard. 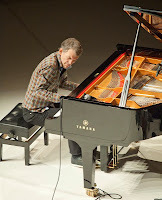 It was a memorial moment that Brad Mehldau sat on his seat in Indian style like he was in meditation while he was carefully watching his friend during this solo, which caused many photographs to be taken from the hall. The audience, naturally, wanted an encore from Brad Mehldau Trio after the concert and rarely played Untitled is performed lastly by them. I have taken my place at the backstage with my questions on my mind and lots of CD covers in my hand just after the concert. I should thank to the organization that convinced Brad Mehldau to see me, although he wanted to see nobody after the concert. The first question was actually a general question that I want to ask any trio pianist that also plays solo. “In which configuration do you think you can use your improvisational power better, solo or trio?” Although I am not fully satisfied with the answer, Brad Mehldau told that he found different good things in different configurations and felt no difference from perspective of improvisation. He talked about his happiness on tour with Joshua Redman lately while I was taking an autograph on a photo of him with Joshua Redman, Christian McBride and Brian Blade. The second question was about rock music which is usually used by Brad Mehldau in solo performances as well as in trio. Well, what was the thing in rock music that drives him to use it in arrangements. 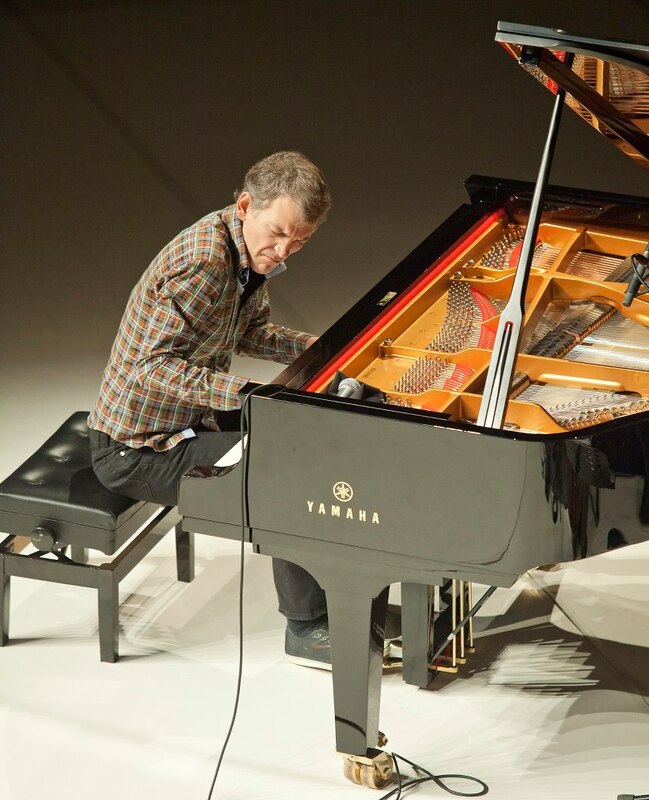 According to Brad Mehldau, rock is not different than any other drivers in his life, which means rock affects and triggered him for new trials such as many things he experienced and liked in his past and present life. As a summary, Brad Mehldau Trio performed one of the best concerts I have seen so far on December 2nd. I hope this productive band will record many more albums and come to Turkey again. If they come again and if you have not listened to them yet please do not miss this time.